When White River Junction resident, David Frazer, was diagnosed with Chronic Obstructive Pulmonary Disease (better known as COPD) several years ago, he didn’t waste any time making the changes his doctor recommended. Step one was to cease smoking, and David didn’t hesitate. “I left everything in the rubbish pail right there,” he said. Step two was to begin an exercise regimen to improve his breathing, and for that, David turned first to a pulmonary care specialist and then to Upper Valley Aquatic Center (UVAC). After three months of regular visits — three times per week — with the pulmonary care specialist, David had increased his breathing and was ready for his next challenge. The specialist recommended that he join a gym and continue exercising several times per week to maintain the progress he had made. UVAC was just down the road and David decided to give it a try, signing on for a two-month membership. Although David was new to the gym scene, he quickly found his footing at UVAC. John Grainger, Fitness & Personal Training Director, showed him around the fitness equipment and helped him get started. David began exercising five days per week on the treadmill and weight machines, focusing on proper breathing, and ended each session by walking laps around the lazy river, which also helped with his balance. After two months, he knew he had found the gym for him and signed up for a full year’s membership. 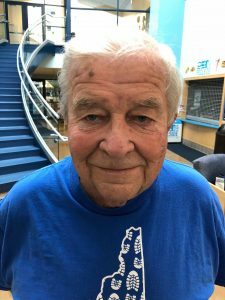 Now 82 years old, David plans to continue his regular visits to UVAC, noting that it’s just about time for a membership renewal. His doctor is pleased with his improvement, and David is happy with both the benefits to his health and the people he’s met. If you’re curious to learn more of his story, you’ll find him in the fitness facility, ready to chat each weekday morning. And if you or someone you know has been thinking of tackling big health and fitness changes, consider taking inspiration from David’s success and making UVAC a daily habit.